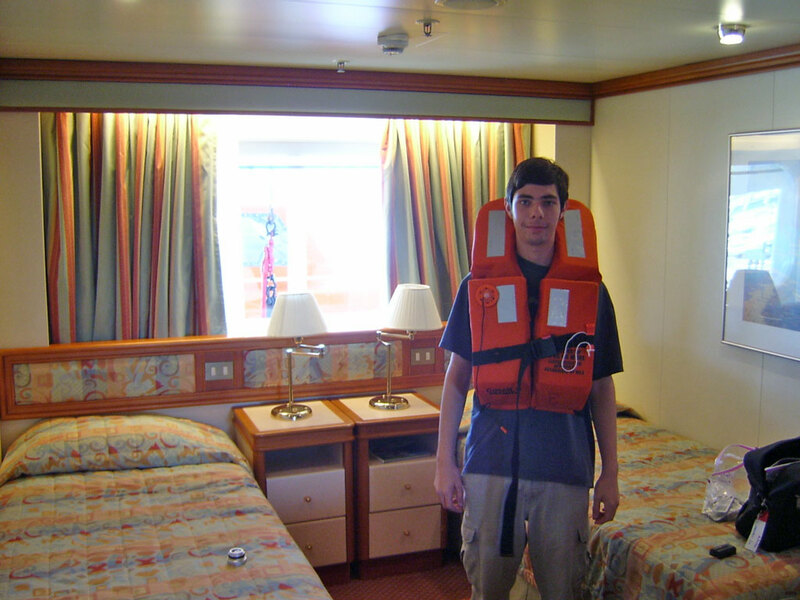 In 2005, my dad took me on my first ever cruise. 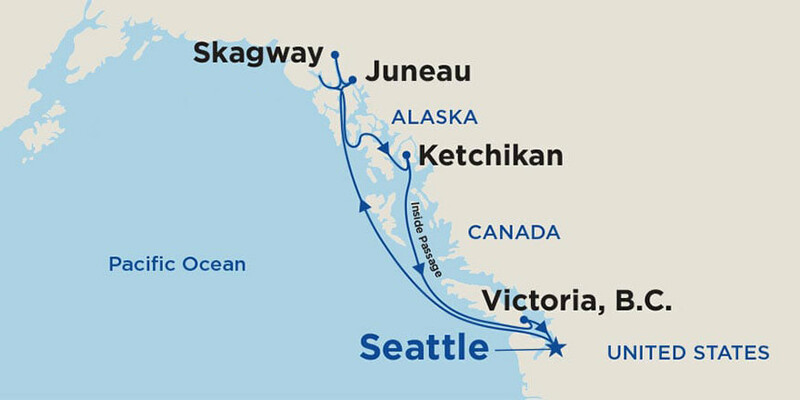 The 7-day journey started from Seattle, Washington with stops in Juneau, Skagway, Tracy Arm, Ketchikan, and Victoria, British Columbia before returning to Seattle. 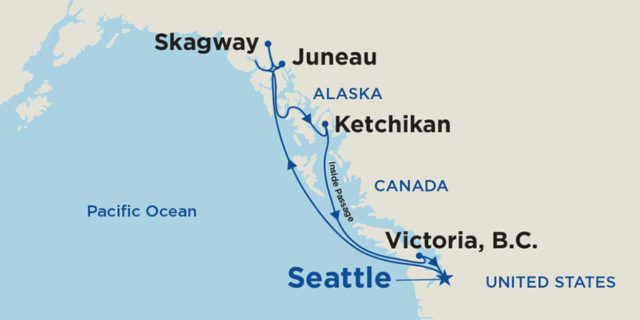 This route is commonly referred to by the cruise companies as the “Inside Passage.” During the voyage, I recorded daily diary entries, which are published here. Our Alaskan cruise adventure began with a flight from Phoenix to Salt Lake City on Delta Airlines. Changed planes in Salt Lake City and continued on to Seattle. Passed over the Grand Canyon and saw the Great Salt Lake and Mt. Rainier from the plane. Smooth flight the whole way, and arrived on time. 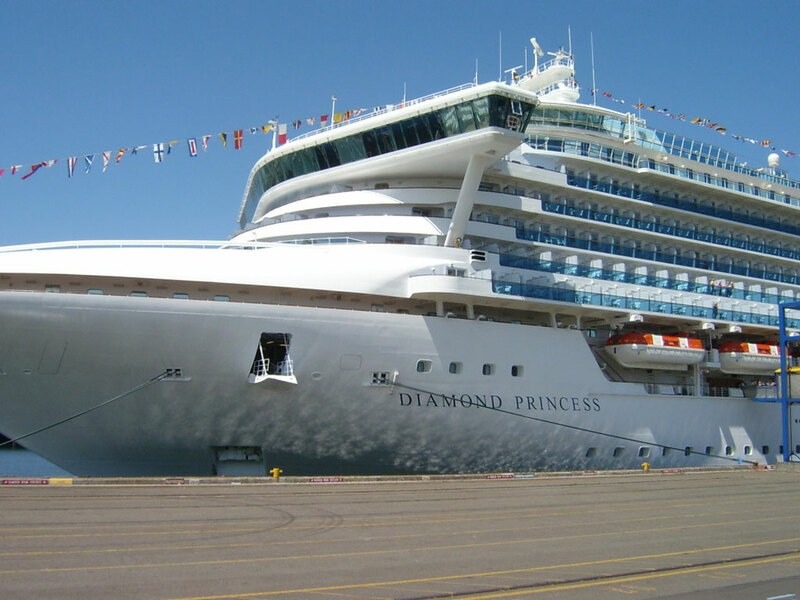 The Diamond Princess docked in Seattle, prior to departure, on July 23, 2005. Took the shuttle bus from SeaTac airport to Dock 30 at the waterfront. Checked in quickly without a fuss and boarded the Diamond Princess. We stayed in room E506 on the Emerald Deck. Very comfortable with all the luxuries of home. Lunch buffet was good, dad and I ate by the window and watched a cargo ship being loaded up by giant cranes. Our ship did a 180-degree turnaround as it pulled away from the dock at 4pm. Stood outside on the deck and waved goodbye to Seattle. Weather was clear and cool, and the sun was shining brightly. We explored the ship and had some pizza for dinner. Saw the string quartet playing classical music, and another band playing out by the pool area. View of the Seattle skyline from our ship as we departed for Alaska. Visited the Princess Theater and saw the Welcome Aboard dance number and comedy show. 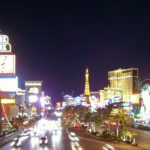 So far we have found the gift shop, art gallery, casino, Internet café, and several restaurants. I think the arcade is closed. Learned that the Diamond Princess was launched in September 2004. The TV in the room gets Discovery, CNN, a movie channel, and one channel with maps, weather, and information about the ship itself. All passengers had to participate in a mandatory lifeboat drill exercise. We had a late dinner in the buffet. Spicy Cajun chicken, mashed potatoes, and strawberry cake for dessert. 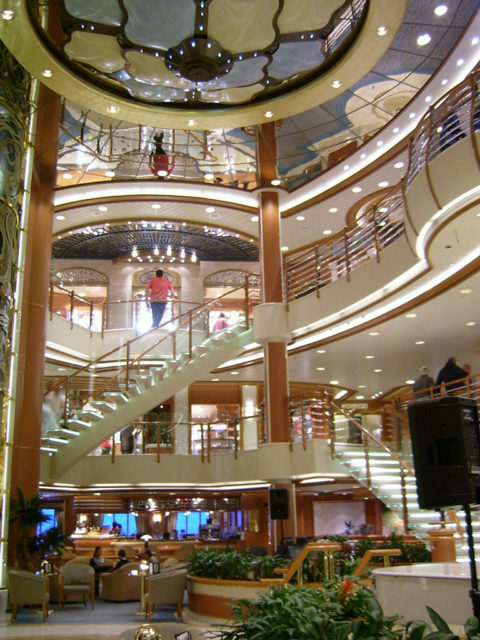 The average passenger gains a pound a day on the ship. The lifeboat drill was a very serious ordeal. Passengers must get their life jackets and report to their muster stations if the general alarm is sounded. Library and the gym are impressive for being on a ship. It is very quiet and stable as we head to Juneau. END DAY 1. Woke up about 8am, hit the breakfast buffet at about 8:30. It was all there: eggs, cereal, pancakes, French toast, and loads of bacon, sausage, ham, and other wonderful things to eat. Sent mom an email from the Internet café. Very fast connection for 35 cents a minute. While walking around, we watched a martini mixing demonstration in the promenade shops. It was entertaining. The Promenade Shops on board the Diamond Princess. Went swimming in the hot tub until 2pm. It was great until you got out, then it was shockingly cold. Cheeseburgers and fries for lunch, everything tasted great. Dad is not getting his money’s worth out of unlimited soft drink pass. We have each had two sodas so far. Headed back to the room for a little nap after that. At 4:15pm we played a few rounds of Bingo at Club Fusion but did not win anything. Walked around the Sun Deck 10 times for one mile of exercise. Dinner was good, I had beef tenderloin with clam sauce, mashed potatoes and a roll. There was a large ice sculpture in the buffet area. Tomorrow we arrive in Juneau, Alaska at half past noon. After dinner we wandered around the Diamond Princess for a bit. Watching an evening show in the Princess Theater. The Captain’s formal cocktail party was underway, but we did not attend. Saw an amazing performance in the Princess Theater called Piano Man. Elaborate costumes, sets, lighting, dancing, and excellent music. Sunset was cool out on deck, even though it was very wet. The sun set over the horizon at 9:45pm. We saw a ventriloquist from 10:15pm to 11:05pm when we got tired of his act and left. END DAY 2. Woke up and had another fabulous breakfast at the buffet. Dad and I hung out on deck and sat in the chairs for a long time. We played shuffleboard and made up our own rules. Got an email from mom, and we wrote her back. The Diamond Princess docked at 12:30pm and we watched a forklift operator connect up the gangway before heading ashore. Stood on Alaskan soil for the first time in Juneau. 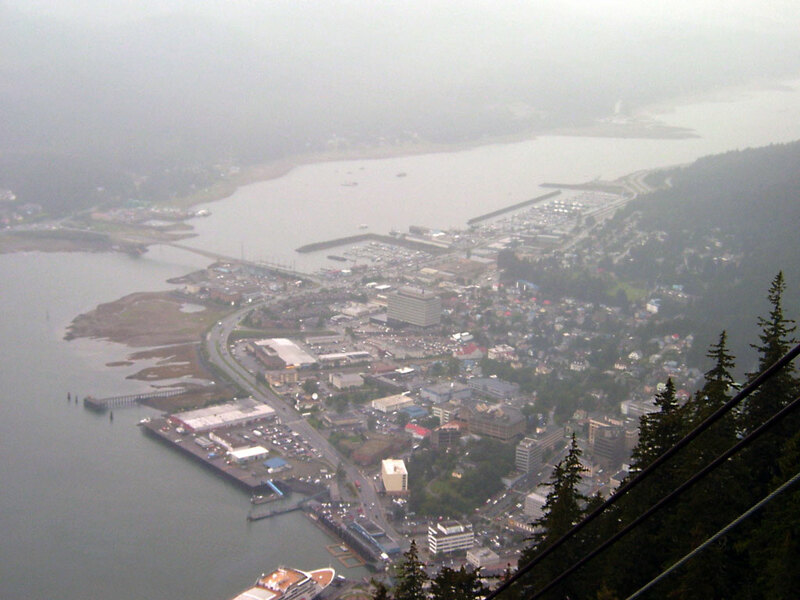 A great view of Juneau, Alaska from the Mt. Roberts Tramway. Dad’s bargain raincoat did not fit him at all so he made me switch with him and I had to wear the tiny, wrinkled jacket. We walked to the Mt. Roberts tramway and took it to the top. Ride was fast and the view was great. Took an unscheduled nature walk through the woods, and then we bought some postcards in the gift shop. Rode back down the mountain with lunch on our minds. Dad found a McDonald’s and he got a placemat that showed the locations of every McDonalds in Alaska. We ran several blocks back to the dock in the misty weather to catch the tour bus. We were the last ones to get on, just made it! 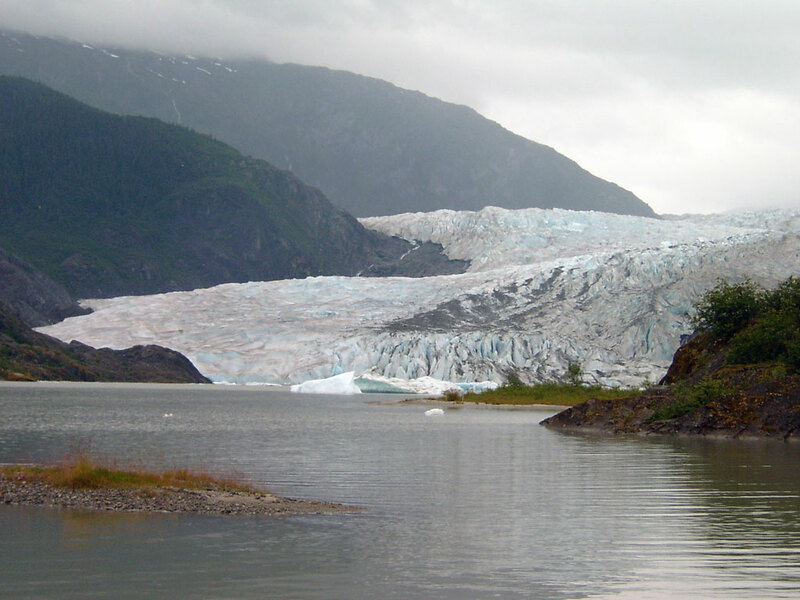 Mendenhall Glacier near Juneau, Alaska. July 2005. We visited the Alaska State Museum for an hour, a Salmon hatchery for half an hour, Green Angel Gardens for half an hour, and Mendenhall Glacier for an hour. At the Gardens we had an apple muffin and some hot, disgusting cinnamon tea. That five hour tour took most of our time on land, minus one little trip to the drugstore before we left. We ate a quiet dinner, filled out some postcards, and fell asleep exhausted. 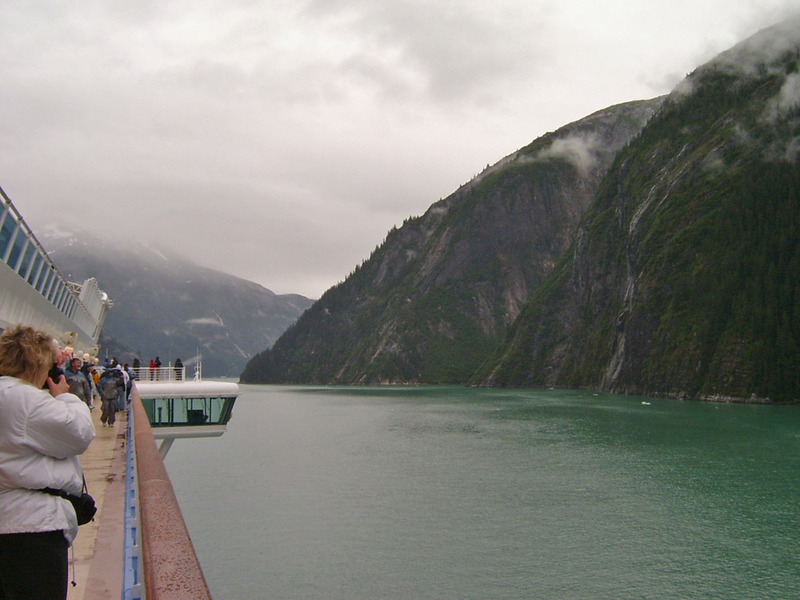 During the night the Diamond Princess sailed 130 nautical miles to Skagway, Alaska and I did not feel a thing. Three other cruise ships from the last port followed us the whole way! END DAY 3. Woke up early today, had the same breakfast in the same buffet. Eggs, bacon, toast, and Froot Loops again. We are in Skagway now! The cliffs are painted up with the names of ships and captains that have sailed into the port of Skagway, done traditionally by the First Mate of a vessel. Higher paintings indicate how much the crew likes their captain. White Pass and Yukon Scenic Railroad stopped at the border crossing in Fraser, British Columbia. 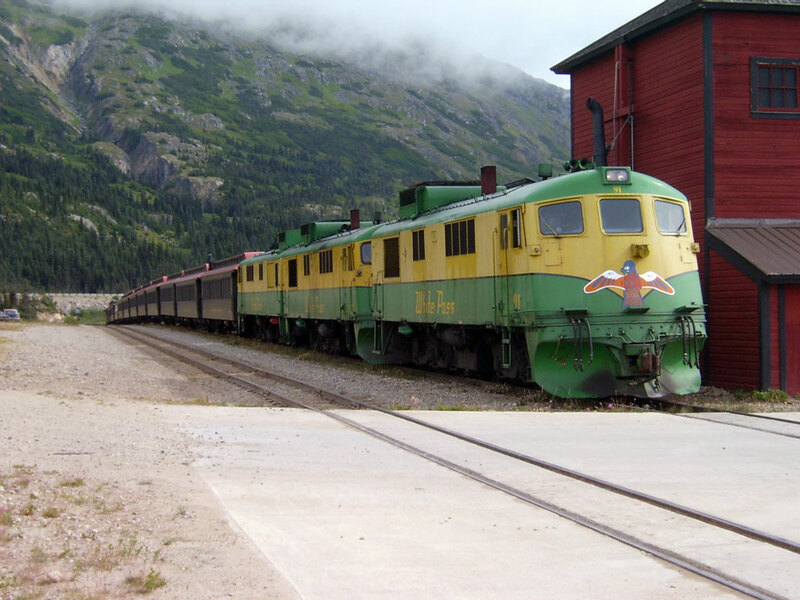 Took a shuttle bus from the dock to the train depot where we boarded the White Pass and Yukon scenic railroad. Rail car was very new inside with free bottled water from the Yukon. Sat on the wrong side of the car and missed lots of great pictures. Crossed into Canada after clearing customs in Fraser, British Columbia. A tour bus took us from Fraser into Yukon territory and the small town of Carcross. 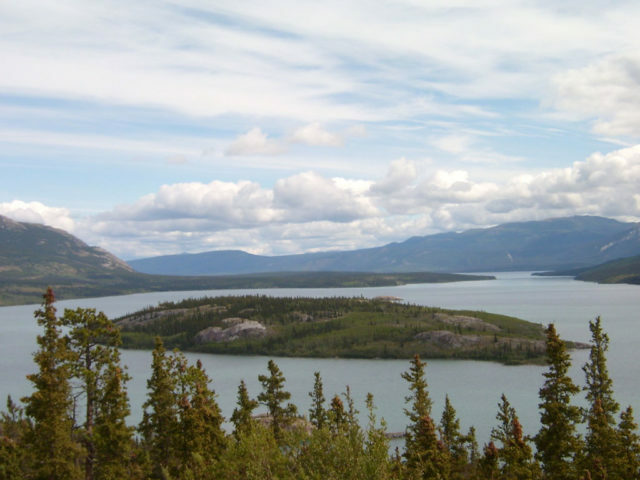 Bove Island, Yukon Territory. July 2005. We had a lunch of BBQ chicken and visited a local history museum. Dad mailed a postcard at Canada Post. Rode 30 miles back to Skagway on tour bus, missed more great photos. Walked around downtown Skagway for a while, mailed my postcards, and bought some gifts at the Skagway Mining Co.
Back on the Diamond Princess, Dad and I picked the Santa Fe dining room for dinner. We thought it was Mexican food, but it turned out to be a fancy Italian restaurant. The waiter pushed in my chair and put my napkin on my lap! The only thing on the menu in English was New York Steak, so we had a couple of those. I had a slice of cheesecake with ice cream for dessert. After that we went to bed. END DAY 4. Dad and I had breakfast at the Horizon buffet again. This is becoming the norm as none of the other restaurants are open for breakfast. 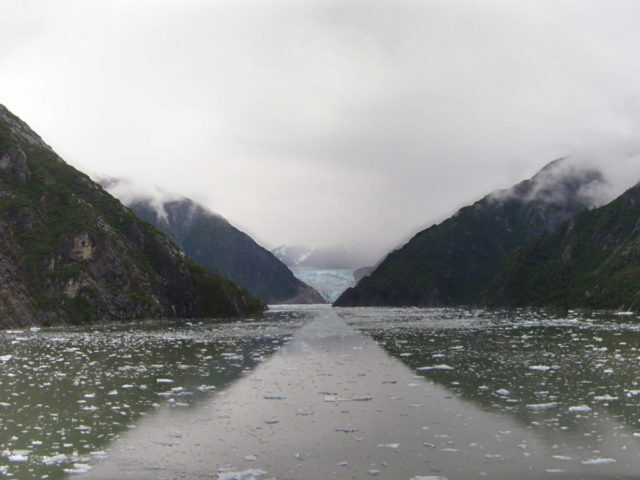 One of the officers was on and off the PA system from about 8am to 2pm, pointing out information about glaciers, icebergs, and waterfalls as the Diamond Princess navigated the Tracy Arm fjord. Sailing into Tracy Arm fjord. Dad and I spent the morning out on deck watching the scenery. Took lots of pictures, saw some icebergs and the water was a beautiful shade of green. We got rained on a little and had some hot chocolate. Pizza for lunch again. Saw a bald eagle from a great distance, two sea otters, and our sister ship the Sapphire Princess. We retired back to the room and watched cartoons until dinnertime. Dad and I both fell asleep while watching TV. Lots of floating ice chunks in the Tracy Arm fjord with Sawyer Glacier in the distance. We ate dinner early so we could watch a show in the Princess Theater. We saw comedian David O’Reilly, his bit was making fun of audience members. Before that show, we watched an art auction in the Explorer’s Lounge. Some guy bought a bronze statue for $34,000 and some other guy bought a painting for $32,000. After the comedy show dad fell asleep and I took some nighttime pictures of the ship with the tripod. END DAY 5. Our ship docked in Ketchikan. It absolutely dwarfs the scale of the town. Got up super early and ate a light breakfast. We were docked in Ketchikan when I woke up. It was sprinkling rain as we boarded the tour bus for the Totem and Town tour of Ketchikan, Alaska. The bus took us around town and then to a park with lots of totem poles and a large house made of cedar logs. Saw a bald eagle on top of a totem pole. Rained on the bus ride back to the dock, then the weather cleared up. 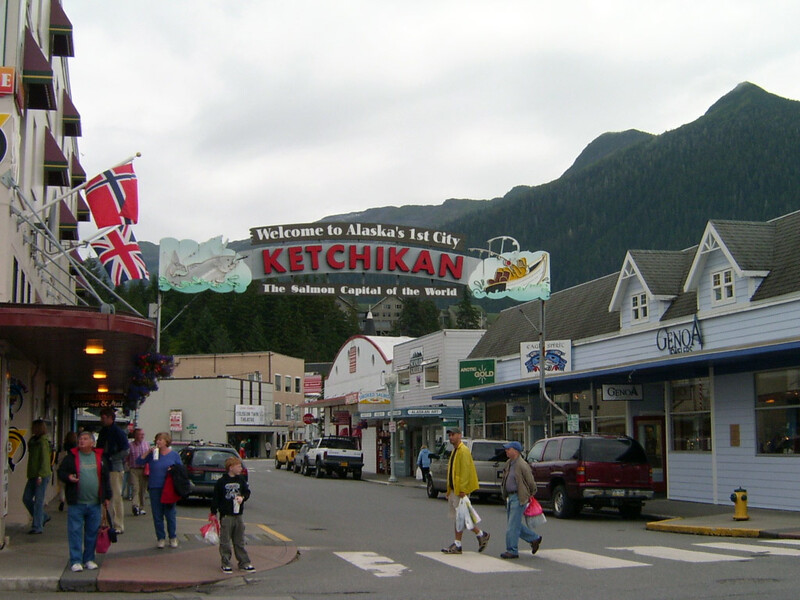 Welcome sign in downtown Ketchikan. 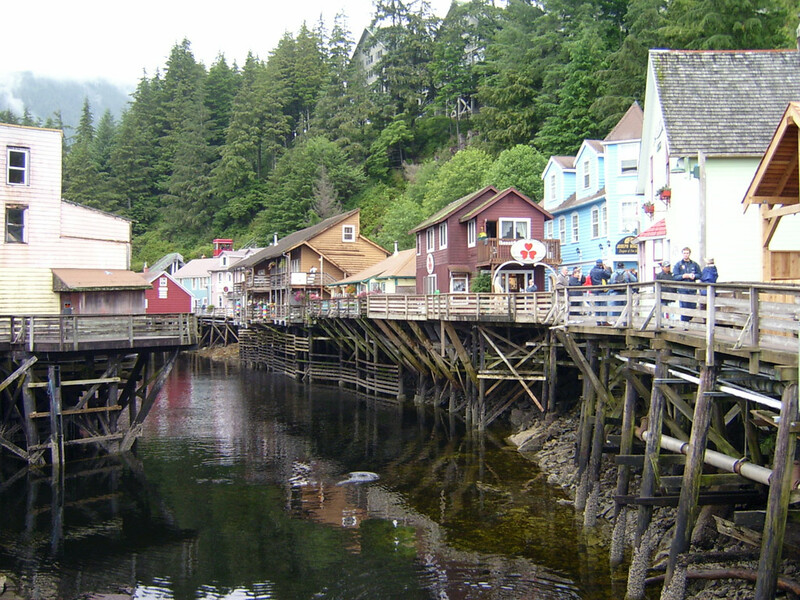 Wandered around Ketchikan’s historic Creek Street, took photos, and bought ice cream. I rode up a mountain in a tram car to a fancy hotel, dad stayed at the bottom because the ride cost two bucks. 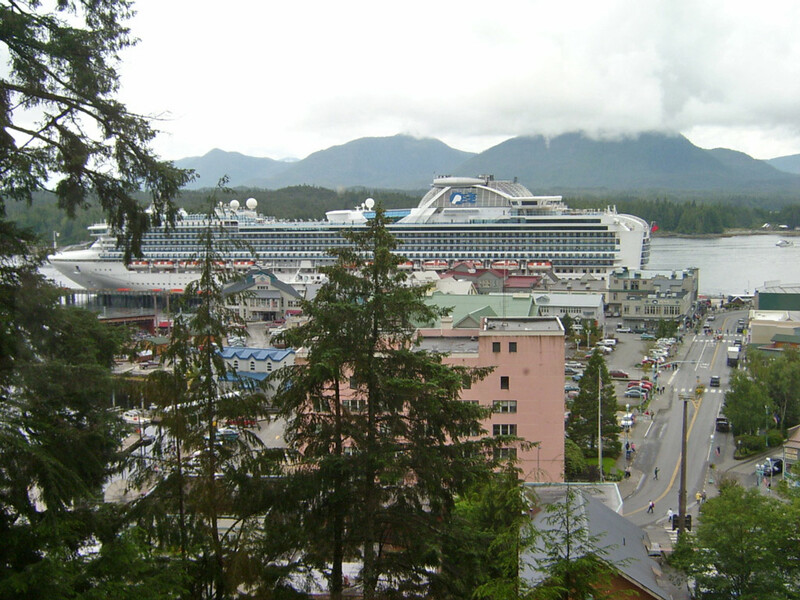 The Diamond Princess left Ketchikan around 12:40pm. Dad and I had cheeseburgers for lunch and then went swimming in a different pool. We are still a long way from Victoria. Creek Street historic boardwalk in Ketchikan. Watched some cartoons and an AFI top 100 countdown on TV all afternoon. Had dinner at the Horizon buffet with another window seat. I had pizza, mashed potatoes, fries, chicken wings, two rolls, and a slice of chocolate cake for dinner. Still too early for the show, we checked out some maps in the ship’s library. The second formal night was going on, with photos, classical music, and lots of liquor. Dad and I saw a show called Undercover, which was a tribute to spies and espionage. They parodied Spy Vs Spy, Austin Powers, the Green Hornet, Charlie’s Angels, and of course, James Bond. It was a fantastic show. Dad stopped by the buffet for a snack and then we went to bed. END DAY 6. Dad and I got up and had a large breakfast. We expected to arrive in Victoria at 7pm, so we had almost all day to do nothing. We took a tour of the kitchen in the Pacific Moon restaurant which was huge and impressive. We walked around on deck for a long time and saw six men repainting the pool. Had some ice cream for lunch and then we went swimming for a couple of hours. I got sunburned on my face and shoulders. 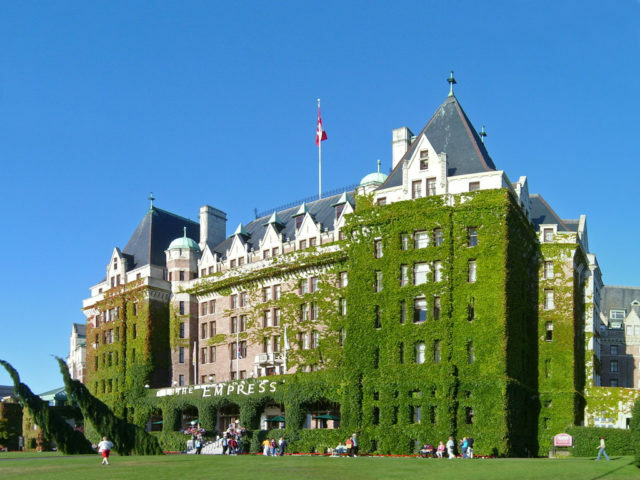 The Empress Hotel in Victoria, B.C in 2005. The ivy covering the building’s exterior was permanently removed in 2014 as part of a restoration. Ate dinner just as the Diamond Princess we pulled into Victoria, British Columbia. We had to put our suitcases outside our room before going ashore so they could be unloaded for us the next day. Took a double-decker bus tour of Victoria and saw the rich neighborhoods, the college, and The Empress hotel. The bus hit lots of low-hanging tree branches as it drove around the Garden City. The bus stopped at Mount Tolmie Park where we enjoyed a panoramic view of the city at sunset. 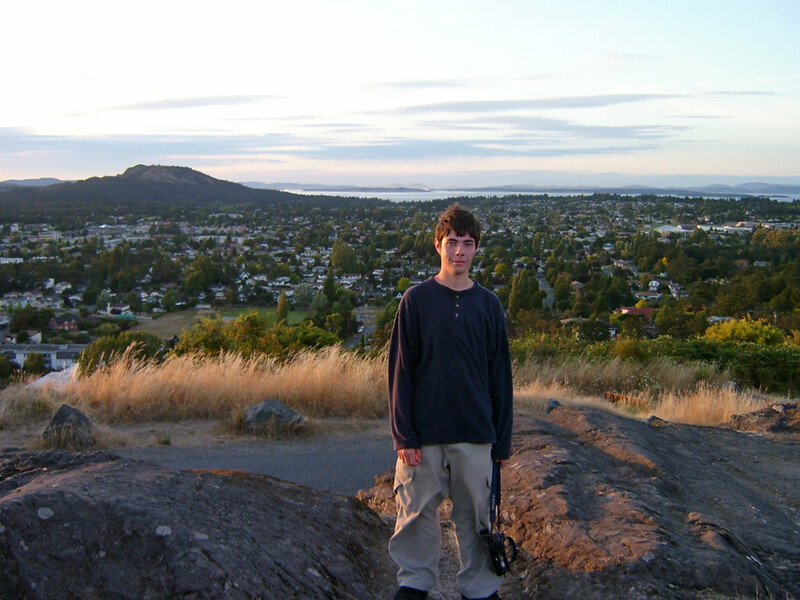 Watching the sunset from Mount Tolmie Park in Victoria. Bought some gifts at the dock before boarding the ship and going to sleep. END DAY 7. Woke up early and had our last breakfast on the Diamond Princess. 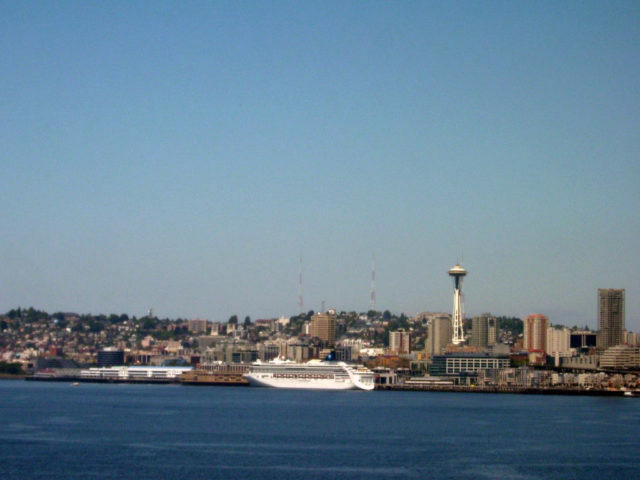 The ship was already docked in Seattle when I woke up. Our group was one of the last to disembark the ship at 9:30am. Walked down to the Princess building where the employees welcomed us back to the USA. We had to locate our suitcases in the massive building full of people and chaos. The shuttle bus to the airport was stressful because the driver ran over a curb, missed the exit for the airport, and got lost trying to find his way back to the freeway. Another passenger directed him to the exit for SeaTac airport. We checked our bags in at the United counter and took a taxi cab to downtown Seattle. It cost almost $40 dollars to get to the Space Needle. 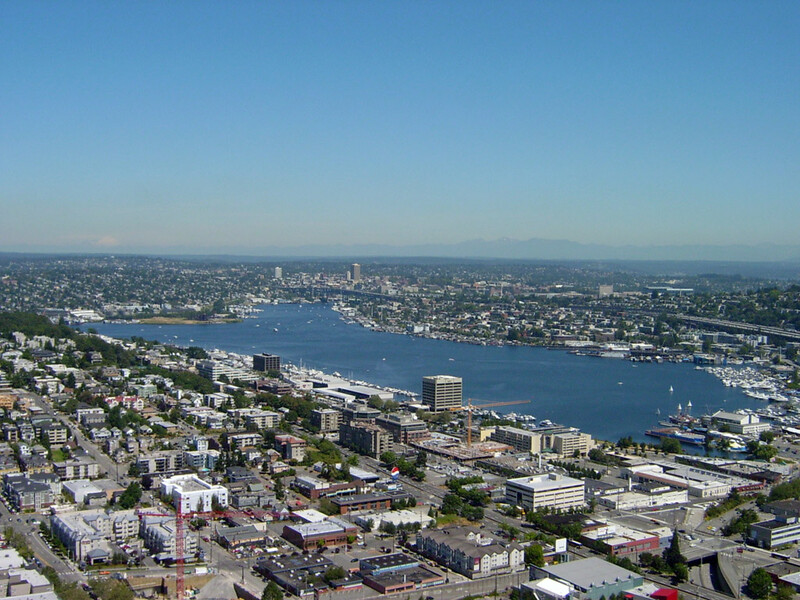 View of Seattle’s Lake Union from the Space Needle. July 2005. We waited in a LONG line to get up to the Space Needle, but the weather was nice so it was not bad. The view from the top was worth the wait. Had McDonalds for lunch. Rode the monorail for a few city blocks and then stopped at a random spot in downtown Seattle. We saw some strange people, and eventually found a bus that would take us to the airport. We saw most of downtown, the fare back was only $1.25. 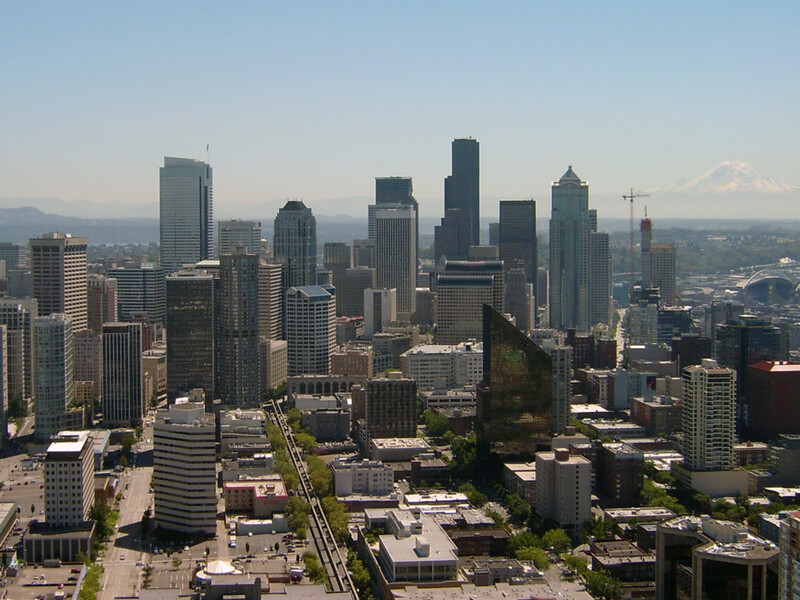 Downtown Seattle and Mt. Hood from the Space Needle. The bus dropped us off at the wrong end of the airport. To get to our gate we had to walk about half a mile to the terminal, go up an escalator, take a subway train to the next terminal, and go up another escalator before arriving at the check-in counter. 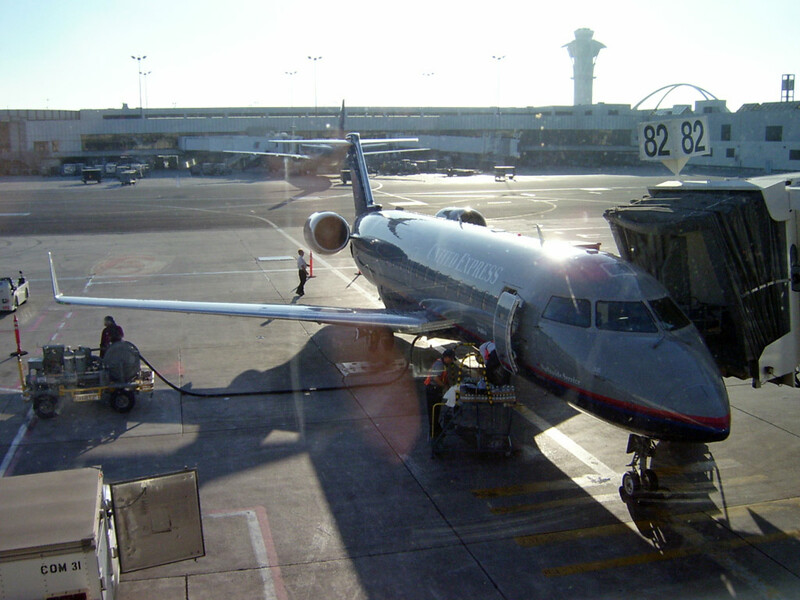 Flew from Seattle to LA on one CRJ200, and then from Los Angeles to Phoenix on a different CRJ200 (pictured) operated as United Express. Flight to Los Angeles was smooth. I got the whole can of 7 Up. Dad had a Pepsi and was really hyper. At LAX we had a long walk to change planes, got on another CRJ200. The flight back to Phoenix took us through a storm and things got a little bumpy but it was thrilling. Came into town at night, landed at the small terminal at Sky Harbor. Mom was there waiting to take us home. END TRIP.